Julika Lackner's exhibition of paintings, Transcendental Representation, displays the territory of that which is beyond experience yet knowable and that which is invisible yet visible. The aerial view is beyond experience in that it is a geographical space that we cannot inhabit as opposed to the landscape space that we do inhabit; however, the aerial view has become commonplace by way of air travel and photography, so it is knowable but often taken for granted as a mere reference to the place that we actually inhabit. In these paintings, the topography seen through the clouds fleshes out the invisible yet visible aspect of air. Painting the palpability of air is the core issue of Julika Lackner's paintings. First, it was in the form of artificial light reflected in the night sky, then through clouds, and now the main focus is the city seen from above. The night sky, the fog, and clouds are the phenomena that give visual substance to the air we cannot see. The Los Angeles landscape acts as the schema for her paintings as it is the foundation for these various phenomena. Thus, Julika Lackner's paintings articulate the dynamic relationship between the atmospheric and geographic elements vying for the viewer's attention. JULIKA LACKNER, 'TRANSCENDENTAL REPRESENTATIONS' When: through April 30 Where: UCSB's Faculty Club Hours: 8 a.m. to 5 p.m. Monday through Friday Information: 893-3096, www.faculty-club.ucsb.edu, www.julikalackner.com In young artist Julika Lackner's impressive exhibition "Transcendental Representations," spreading itself around the walls of the Charles Moore-designed UCSB Faculty Club, the artist has opted to look down on the world, but only literally. As artistic ideas go, hers is a simple yet surprisingly fertile concept and perceptual shift, turning aerial views of the earth below into the stuff of painterly expressivity and, secondarily, ecological commentary. Peering down on the world, from a direct overhead perspective, is a familiar exercise for post-20th century humans with air travel experience, but Lackner, 28, takes it a few steps further. In her paintings, the world below is reduced to a geometric, semi-abstract field, built up from real world elements. The real, the metaphysical and the painterly craftily merge. 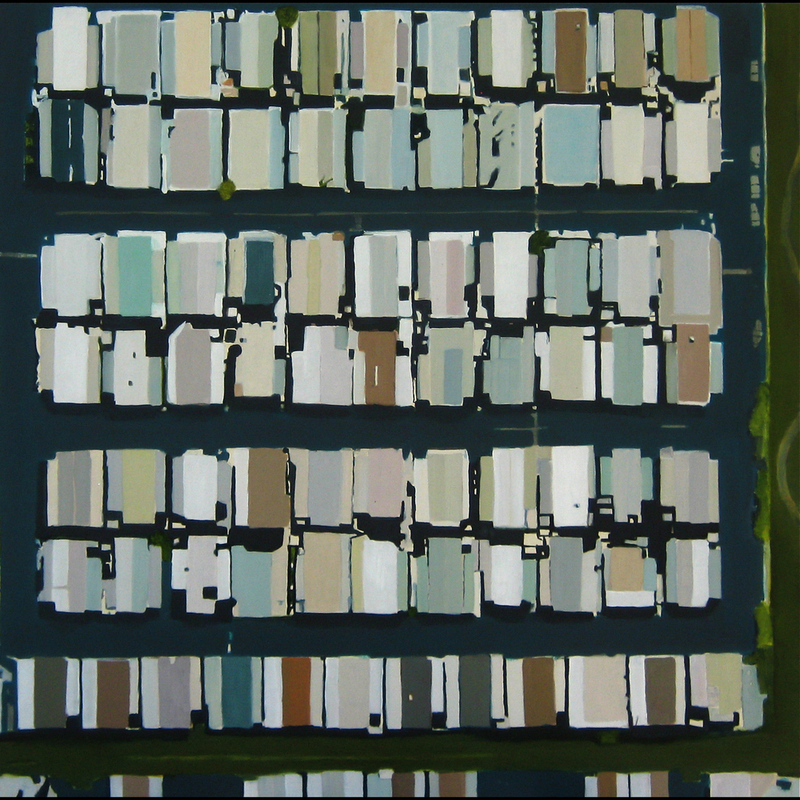 In several paintings, including the dazzling "Adrift" and "Where the Summer Spends the Winter," bodies of water are juxtaposed with housing developments, which have been reduced to rectilinear clumps of data and shapes. The housing areas become busy, right-angled and humanized terrain nuzzling up against the wild, untamable oceanic expanse. Other paintings survey pure snatches of the urban landscape, made to appear harmless and tidy from on high. Neatly placed rectangles in grids are coated with greenery and softened by the vaporous clouds between the airborne observer and the observed scene on the ground. Pollution, venality and other ground-level sins seem far away. In Lackner's show, which includes several large and formidable canvases dramatically displayed along one wall, the artist takes heed of the importance of variety within the self-imposed limitation of her concept, employing diverse angles, subjects and palettes. On one extreme, "Two Blues" is a loose and nearly abstracted painting, consisting only of a deep sky blue hue, tickled by puffs of cumulus. By significant contrast, the sizable painting called "Afloat" is anything but flotation in spirit. It's a depiction of a marina scene, with its congregation of boats, buildings, parked cars and other man-wrought objects, adding up to a polyrhythmic racket for the eyes. Although the temptation may exist to read Lackner's body of work as a more-or-less direct indictment of the encroachment involving man's doing — and undoing — upon nature, as represented by these two contrasting paintings, such a response would be overly simplistic and misguided. In a sense, she is playing the non-judgmental, objective observer, presiding over the casa of the strange interaction between nature and civilization, from a window-seat perch. Once on the ground, the discovery and transformation process continues, in the contemplative confines of a studio and a painter's brain. At Julika Lackner's show, "Transcendental Representations," on exhibit at UCSB's Faculty Club, is (clockwise, from top left): "Two Blues," "Afloat," "Adrift" and "Where the Summer Spends the Winter." The show hangs through April.